How Do I Use Time Wisely? How can goals help me be a more effective missionary? What should be the focus of my goals? What are my planning tools and resources, and how do I use them? Why is the area book important? How do I conduct weekly and daily planning sessions? How will I know if my goals and plans are helping to further the Lord’s work? You are assigned to do the Lord’s work in a specific area. He wants you to watch over your area with love and great care. Your purpose is to help others come unto Him through faith, repentance, baptism and confirmation, and enduring to the end. Do all you can to leave your area stronger than you found it. Meaningful goals and careful planning will help you accomplish what the Lord requires of you. As you care for the people in your assigned area, you will account to Him and to your mission leaders. Your missionary call letter states: “As you devote your time and attention to serving the Lord, leaving behind all other personal affairs, the Lord will bless you with increased knowledge and testimony of the Restoration and of the truths of the gospel of Jesus Christ.” This chapter will help you know how goal setting, planning, and accountability can help many people receive the restored gospel. How does the Lord feel about His children? What kind of effort does the Lord require of His servants? Perhaps you have wondered which of your many duties are the most important. To be able to answer this question, you must understand your purpose and know how effective use of time can help you fulfill this purpose. People baptized and confirmed: Each convert who has received the ordinances of baptism and confirmation. People with a baptismal date: Each person who has agreed to be baptized and confirmed on specific dates. People who attended sacrament meeting: Each person (not baptized) you are teaching who has attended sacrament meeting. New people being taught: The total number of people (not baptized) who have received a lesson and accepted a specific return appointment. A lesson typically includes a prayer (when appropriate), the teaching of at least one gospel principle or topic, and extending appropriate invitations. As you set goals and make plans, evaluate what you do in terms of how your efforts will add to the numbers of people represented in each of these key indicators. Your goal should be to have increasing numbers for every key indicator. You will do many things that are not described in the key indicators, such as street contacting or personal and companion study. These important activities contribute to one or more of the key indicators. For example, when you teach those you find through your own efforts, you add new people to your teaching pool. Also, the quality of your personal and companion study will improve your ability to teach by the Spirit, blessing the people you are teaching. The power of your finding and teaching will influence every key indicator. Evaluate all you do based on whether it adds to the numbers of people in these categories. If you and your companion cannot see how a missionary activity might help increase the numbers of people in one or more key indicators, you need to question whether the activity is worth your time. In your study journal, list every missionary activity you have done in the past three days. For each activity, determine if it influenced one of the key indicators. If it did, write yes beside it. If it did not, write no. For each activity with a yes, describe how it had an impact. For each activity with a no, decide why you did it and whether you will continue to do the activity in the future. Discuss your list with your companion, and explain why you marked some activities yes and some activities no. Discuss which activities you may need to stop doing. Concerning those who were received into the Church by baptism and confirmation in his day, Moroni taught, “Their names were taken, that they might be remembered and nourished by the good word of God, to keep them in the right way” (Moroni 6:4). How would I feel if someone shared this kind of information about me with others? Am I following Church policies if I record or share this information? Every teaching area has an area book (printed or a digital tool), which becomes the lasting record of your day-to-day efforts. Update key information daily, and refer to it weekly during your weekly planning session. Keep it neat, current, and accurate so that any future missionary can build on the inspired service you have given. As invited, take your area book to interviews, zone conferences, and mission leadership council, where mission leaders can review it and help you know how to use it most effectively. You should refer to some part of the area book each day as you update and adjust your plans. This book should stay in your apartment after you are transferred so that future missionaries can use the information. In your area book, keep accurate, complete, and current records of all the people with whom you are working. An explanation of the tools that are provided follows. 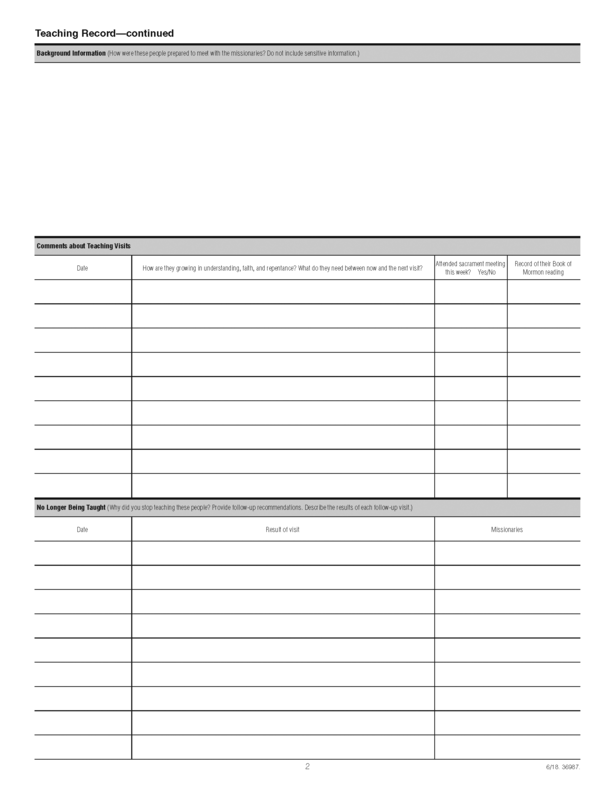 Teaching Record: This form helps you record detailed information regarding the progress of people you are teaching. Personal information (follow the Church data privacy policies for your mission). Dates of baptism and confirmation. A record of when you taught the principles from each of the five lessons and if a member was present. This section allows you the flexibility to track what you teach, regardless of the order in which you teach the principles. You can track lessons taught before baptism and lessons taught after baptism. A record of the status of the commitments people are to keep. In this section you record the date you extended the invitation and mark whether they are consistent in keeping the commitment. A section where you describe the background of the person or family. Do not include highly personal or negative comments (follow the Church data privacy policies for your mission). A section where you describe important information from teaching visits. You might include concerns people have raised, commitments they have struggled to keep, and successes they have had in reading or in prayer. You can also indicate if they have attended church and what they are reading in the Book of Mormon. A section where you can track follow-up visits if the person or family stopped receiving lessons. When a Teaching Record has been created, it should remain in the area book for the appropriate amount of time as indicated by the Church data retention policies in your mission. Progress Record: This record enables you to summarize the progress of the people you are teaching. It also allows you to report on the key indicators. Use this record to coordinate your efforts with ward and stake leaders in missionary coordination and ward council meetings. You will update this record during your weekly planning session or before ward council meetings. If feasible, give copies of this record to the bishop, the ward mission leader, and other ward council members each week or as often as needed. (When digital planning tools are used, these reports are sent automatically.) Make sure the information you include on these forms is complete, accurate, and neatly written. People with Interest: This form enables you to keep a record of people who you have contacted or have received referrals for and who, through additional contact, may accept an invitation to learn about the restored gospel. If the person was a referral or found by missionaries. The date the person was contacted. Copy important information from the “People with Interest” section of the Missionary Daily Planner to the People with Interest form. Use this information to plan follow-up visits, review member-missionary work with the ward mission leader, and plan other activities that may help these people begin learning more about the restored gospel. This form also serves as a historical record for missionaries assigned to the area in the future. When you are transferred to another area, be sure to copy all the information from your Missionary Daily Planner. Weekly and Monthly Key Indicator Report: Use this report weekly to collect information on each of the key indicators. Each companionship should access and record this information on the Missionary Portal or through digital tools. The information you enter will automatically be sent to your mission president. If you do not have access to the Missionary Portal, then give this information to your district leader. The district leader writes the name of each companionship in his district on a Weekly and Monthly Key Indicator Report, along with their weekly totals for each key indicator. He then totals the results for the district at the bottom. Information flows upward. District leaders give district totals to their zone leaders. Zone leaders give zone totals to the assistants to the president. Five weeks of daily schedules, with a sixth week on an at-a-glance page. Pages for monthly and weekly goals. A summary of the planning guidelines; a list of the events that lead to baptism, confirmation, and activity in the Church; lesson plans of the missionary lessons; ideas for finding people to teach; and baptismal interview questions. A section for information on contacts and for addresses, email addresses, and phone numbers of members and people being taught. Weekly and Monthly Key Indicator Results page for keeping track of your weekly and monthly results. Each companionship should access and record this information on the Missionary Portal or through digital tools. During your weekly planning session, you will write your monthly and weekly goals on the Monthly and Weekly Goals and Plans page of the Missionary Daily Planner as illustrated below. Weekly goals for each key indicator and a monthly goal for people baptized and confirmed. Actual results for the week. The results for new people being taught each day are found on the daily schedule. The total for each week is transferred here. Names of people who are most likely to continue to progress toward baptism and confirmation. Set goals for what you hope will happen with these people (attend church, read the Book of Mormon, set a baptismal date, and so on). Space to write other personal or companion goals. Each day as you plan and work, you will use the daily schedule. A daily schedule where you can record teaching appointments, meetings, and finding activities. Plan so that you have meaningful activities for every hour of the day. Space is also provided for backup plans. Space to list the tasks you need to do (phone calls, people to contact, preparation for lessons, follow-up on commitments, and so on) and what you will study as you prepare for teaching assignments. Daily goals and actual results for new people being taught. Missionary Weekly Report: While the mission president will receive a weekly report on key indicators through the Missionary Portal, you will provide a brief account of the progress of the people you are teaching and any personal matters you wish to share through a weekly letter to the mission president. He is the only person who will read this letter, so feel free to be open with your comments. Goals reflect the desires of our hearts and our vision of what we can accomplish. Through goals and plans, our hopes are transformed into action. Goal setting and planning are acts of faith. Prayerfully set goals that are in harmony with the Savior’s command to “teach all nations, baptizing them in the name of the Father, and of the Son, and of the Holy Ghost” (Matthew 28:19). Set goals for each key indicator. You may also set goals for your personal development. Do everything within your power to achieve your goals while respecting the agency of others. The ultimate measure of success is not in achieving goals alone but in the service you render and the progress of others. Goals are a means of helping you bring about much good among Heavenly Father’s children. They are not to be used to receive recognition. Focus on the people, keeping in mind the key indicators for conversion. Although you will use numbers, be able to support your numbers with the names of people where possible. Be specific and realistic, but set goals that will make you stretch. Set daily, weekly, and monthly goals. Goals for key indicators are reported through the Missionary Portal or digital tools. Set goals for personal and companion study, including language study if you are learning another language. Measure your progress each day, each week, and each month. When you fall short of a goal, evaluate your efforts and seek for ways to accomplish the goal. If needed, adjust your expectations. Over time your mission president may establish standards of excellence or mission goals intended to raise your vision and increase your faith. District, zone, and mission standards will help you stretch, work effectively, and reach higher levels of performance. They are not to be used as quotas that impose specific goals on you and your companion. Are there names associated with the number? Will the goal make us stretch? Are we committed to this goal? Discuss each goal. If necessary, determine how you might revise it and why. Once you have set goals, decide how you will achieve them. You and your companion should hold a weekly planning session on a day and at a time that is less productive for sharing the gospel. Your mission president will set the day and time of the weekly planning session. This weekly planning should not take more than two to three hours to complete. Your discussion should focus on the needs of people and how to help them progress. During this weekly planning session, review past goals and set new goals for the coming week and month. Consider every aspect of your missionary work. Sunday evening is the recommended time for completing the Weekly and Monthly Key Indicator Report. If you do not report key indicators automatically or through the Missionary Portal, then a Sunday-evening report provides the most accurate and timely status of the mission because most baptisms and confirmations take place on Saturday or Sunday. Because the day you hold your weekly planning session is likely to be different from your reporting day, approach your weekly planning with 10 days in mind. For example, if your weekly planning session is on Thursday, you will review the progress on your goals so far that week, and you will plan what you need to do to achieve these goals through Sunday. Then, set goals and make plans for the next week from Monday to Sunday. On Sunday evening you will total and report the results from the past week, and you will have your plan ready for the coming week. Below is a description of how the planning guidelines apply to a weekly planning session. As you use these guidelines, notice that you will follow a pattern of first setting goals and then making plans to achieve them. The plans you make should identify the specific steps you need to take to reach your goals. Pray for and seek inspiration. Before you begin, have your planning tools near, such as the Missionary Daily Planner and area book or digital tools. Begin your planning session with prayer. Seek inspiration as you discuss the needs of people and plan how to serve them and help them progress in the gospel. Pray specifically for those you are teaching. Have the faith to ask Heavenly Father to bless them with answers to their prayers, with a desire to attend church, and so forth. Set goals and make plans for people to be baptized and confirmed in the coming week. Review the Teaching Record for each person who is committed to be baptized or confirmed in the coming week. Discuss the arrangements you need to make for baptismal interviews, services, and confirmations. Using the Teaching Record, discuss any commitments these people may be struggling with and how you can help them. Plan to make daily contact with them. Discuss how you can help the ward mission leader coordinate with the bishop for their confirmations in sacrament meeting. Set goals and make plans for people with a baptismal date. Review the Teaching Record for each person who will be baptized in the coming weeks. Talk about lessons you need to teach them. Consider how you can help them prepare for baptism and confirmation. Discuss why someone might not have been baptized on their scheduled day. Carefully consider and discuss their needs. Set new goals and make plans that will help them progress toward a specific day and time when they can enter into the covenant of baptism and receive the ordinance of confirmation. On your Teaching Record, record the principles you plan to teach and the commitments you will help them keep. Determine what you can do to help them receive these lessons and keep these commitments. Set goals and make plans to help people attend sacrament meeting. Review the Teaching Record for each person, and discuss his or her attendance at sacrament meeting. For people who are attending sacrament meeting regularly, discuss what you need to do to help them continue to have a spiritually uplifting experience. For those who have never attended sacrament meeting, who have attended only once, or who attend occasionally, discuss what might be keeping them from coming. For example, they might need help with transportation, they may be afraid or unfamiliar with Church services, or they may have had a negative experience in the past. Discuss what you can do to help them overcome these barriers. Set goals for the number of people you plan to have in the next sacrament meeting. Plan who will take these people to church, who will greet them, and who will sit with them during meetings. Plan to contact quorum and auxiliary leaders and any teachers responsible for the classes the visitors will attend. Plan to inform the bishop. On the Progress Record, list ways the ward council can help. Make plans for what you need to do on each day of the week to prepare these people to attend. Set goals and make plans for lessons to be taught to people who are progressing. Review the Teaching Record for each person who was taught with a member present. Talk about how you feel they are receiving the message. Review the commitments and events from the Teaching Record that they are striving to keep or complete. Discuss how to help ward members and the ward council remain involved in their progress. Set goals for the lessons you will teach; the commitments you will help them keep, especially attending church, studying the Book of Mormon, and praying; and important experiences you will help them have over the next several weeks. Review the Teaching Record for each person who was taught without a member present. This may be someone you found through your own efforts. Discuss which priesthood or auxiliary leader could be invited to friendship them. Review the lessons you will teach and the commitments you will help them keep. Set goals for the lessons you will teach, how you will involve members, and how you will help these people attend sacrament meeting. Record these goals on the Teaching Record, and make the necessary plans. Set goals and make plans for lessons to be taught to everyone else you are teaching. Review the Teaching Record for each person who is not progressing. Discuss why they are not keeping commitments. Discuss how you will involve priesthood and auxiliary leaders in friendshipping these people. Discuss many of the same items suggested in step 5. Set goals and make plans to help them progress. Write these goals on the Teaching Record. Set goals and make plans to contact and teach referrals received from members, missionaries, Church headquarters, and others. Review the People with Interest forms. Review all the referrals you have received. Review the referrals you have not yet contacted. Set goals and make plans to contact as many referrals as possible during the week—preferably all the referrals. Referrals should be contacted within 24 hours, if at all possible. Contact the person who submitted the referral to learn more and to plan how you might work together with them. Discuss how you might approach each person or family and what message you might teach. If the referral is from Church headquarters, discuss how you will teach a gospel message using the video, book, or other material they have requested. Make sure you have the item they requested. If appropriate, contact the referral by phone or text message and schedule an appointment. Discuss what follow-up you should do. Set goals and make plans to seek more referrals from members and people you are teaching. Prayerfully identify people you can visit. Plan how you will help them invite their friends and family members to learn about the restored gospel. Discuss how you will invite them to participate in missionary work. Schedule appointments and make necessary plans. Set goals and make plans for lessons you will teach to recent converts and returning members. Review the Teaching Record for each recent convert and returning member you are teaching. Set goals and make plans for lessons you will teach. Determine how you will help these people attend sacrament meeting and keep other commitments. Set goals and make plans to find new people to teach. Review the previous week’s efforts to find new people to teach through referrals, service opportunities, and personal finding activities. Discuss why some people showed interest in learning more and others did not. Set goals for how many new people you will find this week. Identify people who are likely to want to learn more. Also identify members and part-member families you want to visit, referrals to visit, and service opportunities you will seek. Plan which finding tools you will use, such as pass-along cards, DVDs, or scriptures. Also discuss where you will go to contact people, how many people you will contact each day, people you will ask for referrals, people you will visit who have been taught previously, ways the ward council can help, and so on. Fill in all remaining time with finding activities that will help you achieve your goals. Set goals and plan to talk to as many people as the Lord puts in your path. Always strive to find people to teach. Plan how to work with the ward council. The bishop is the presiding authority. Respect and honor his authority. Under his direction, review the Progress Record used in the previous missionary coordination meeting or ward council. Discuss assignments you have received from the bishop or ward mission leader, and report on whether you have completed them. Discuss how to involve others who can help, such as the ward mission leader, priesthood and auxiliary leaders, and other members. Carefully prepare a Progress Record for the upcoming ward council meeting or missionary coordination meeting. Make sure it is accurate, neatly written, and clean. Set goals and make plans to work in harmony with the ward leaders. When possible, make copies of the Progress Record for the ward leaders who will attend. If your mission uses digital tools, an electronic copy of the Progress Record is automatically made available to ward leaders. Schedule meetings that occur regularly. In your Missionary Daily Planner or digital tools, schedule meetings that happen regularly, such as district council, zone conferences, mission leadership council, interviews, and Church meetings. Discuss assignments you need to complete prior to any of these meetings, and add them to your Notes/To Do List. Conduct companionship inventory. At the end of your weekly planning session, share with your companion appropriate goals, and ask for his or her help to accomplish them. Discuss the strength of your relationship with your companion. Discuss any challenges that may be keeping your companionship from working in unity or from being obedient. Resolve conflicts. Share with your companion what you think his or her strengths are. Ask for suggestions on how you can improve. If needed, set goals that will improve your relationship. Conclude with prayer. With your companion, hold a planning session each morning. Apply the same principles and guidelines in a daily planning session that you follow in a weekly session but in a simpler way. Be prayerful as you discuss the lessons or topics you can study during personal and companion study time that will help you with your plan. Write these topics in the lined space provided on the Daily Goals and Plans page. Review your daily schedule. Have a meaningful activity planned for every hour of the day. During your Sunday planning session, account for the progress of the people you are teaching in order to report to your mission president and finalize your goals for the coming week. Approach your goal setting and planning with the idea that you will account for your efforts to your mission leaders and to the Lord through prayer. Feel personal responsibility for the sacred trust the Lord has given you. Choose to be proactive in accounting for your work to the Lord and to your mission leaders. Don’t wait to be asked. Don’t require others to follow up with you frequently. Have a desire to account for your labor. Accept full responsibility for your efforts. Never blame others for difficult circumstances or lack of progress. Seek to learn from your leaders, and invite them to suggest ways you can improve. Be motivated to do your best work. Accountability does not come only at the end of your mission. It is a principle that influences how you begin, how you think and feel about the responsibility the Lord has given you, how you approach your work, and how well you endure. The attitude you have toward your mission experience is a reflection of your love toward your Heavenly Father and His Son and your respect for the priesthood. As you pray personally and in your companionship, seek inspiration on what you should do each day. As you follow your plans, pray and ask the Lord for guidance. Have a prayer in your heart throughout the day that the Spirit will help you know where to go, what to do, and what to say. Ask yourself, “What more can I do?” In your prayer at the end of the day, give an accounting of your work. You will give an accounting each week to your mission leaders during your weekly report, during district council, and in other settings throughout the week. If you are a mission leader, you will receive this information from other missionaries. Show an interest in their lives and in the lives of those they teach rather than simply in numbers. Do not use these tools or the information you receive as ways to control or manipulate. The information you receive through these tools will provide you with opportunities to praise missionaries for their dedication and to see opportunities for future training. Why is agency important in accountability? How should a missionary and a mission leader work together? Focus your efforts on your purpose. Set goals according to the key indicators. Pray mightily over your goals and plans. Use the area book, the Missionary Daily Planner, or digital planning tools to help people develop faith, repent, be baptized, receive the gift of the Holy Ghost, and endure to the end. For each key indicator, set goals that help you stretch, exercise faith, and work effectively. Conduct weekly and daily planning sessions that focus on helping others progress in the gospel. Account for your efforts to the Lord and to mission leaders. What do you want to say you have done as a missionary? What do you want to have become? What differences would you want others to notice in you? In your study journal, write an answer to each of these questions. Determine what you need to do now to realize these goals. Write the plans that come to mind. Are all the records current, accurate, and easy to read? Would a missionary who is new to the area be able to review the area book and know where people are in their spiritual progress and what more needs to be done to help them? Would a missionary who is new to the area benefit from your efforts to find new people to teach? Picture yourself presenting your area book to the Lord as you give an accounting of how you have cared for the people in your area. Would the Lord be pleased with your efforts? Discuss one person you are teaching. In your Missionary Daily Planner, locate the page titled “Events That Lead to Baptism, Confirmation, and Activity in the Church.” Select one event, and make a list of everything you need to do in order for this event to happen. Discuss how you might plan these tasks so that the event can happen at the earliest possible time. Discuss the following analogy with your companion. Evaluate how long your “line” is in the water each day. “None of us should be like the fisherman who thinks he has been fishing all day when in reality he has spent most of his time getting to and from the water, eating lunch, and fussing with his equipment. Fishing success is related to how long you have your line in the water, not to how long you are away from the apartment. Some fishermen are away from home for twelve hours and have their line in the water for ten hours. Other fishermen are away from home for twelve hours and have their line in the water for only two hours. This last type may wonder why they do not have the same success as others. “The same principle applies to missionaries, whom the Master called ‘fishers of men.’ A missionary’s line should drop into the fishing water the moment he or she leaves the apartment” (Dallin H. Oaks, seminar for new mission presidents, June 20, 2000). Read one of the following situations to the missionaries. In small groups, have the missionaries discuss goals and plans that will help the people in these examples progress toward baptism and confirmation. Have each group share their ideas. Situation one: You met Larry and Beth when they were giving service at a food kitchen. You have taught them one lesson, and now they want to know more. They do not know any members of the Church. Beth is Christian, and Larry does not claim any particular religion. They are not married but do live together. Larry works from 4:00 p.m. to 12:00 midnight. Beth works daytime hours. Situation two: Steve has taken all the lessons and attends church at least twice a month. He believes that Joseph Smith is a prophet and that the Book of Mormon is true. His family members are devout Catholics and do not approve of his meetings with the missionaries. Situation three: Jill is a college student. She has a friend who is a member of the Church. Her member friend invited her to meet with you. You have taught her two lessons. Her member friend was present at both. She has not attended church yet and is so busy with her homework that it is difficult for her to read from the Book of Mormon. Develop greater faith in the Savior. Repent and make changes that have brought them closer to God. Receive the covenant of baptism and confirmation. Come back to the Church and renew the baptismal covenant. Open a new teaching area. Prepare a zone conference training session on introducing the Book of Mormon to people who are interested in learning more. Integrate a family you are teaching into the ward. The family has three children: an 8-year-old girl, a 12-year-old girl, and a 16-year-old boy. Tell the missionaries they have eight minutes to develop a plan. One of the missionaries should write the plan down, including the daily activities. What did the missionaries need to know in each situation? What might the result be if you do not plan meaningful activities or do not plan at all? How are planning and goal setting acts of love? acts of faith? Ask missionaries to bring their area books to zone conference, to mission leadership council, or to interviews. In addition to reviewing the area books yourself, consider having mission leaders or your companion review the area books. Occasionally observe missionaries’ weekly or daily planning sessions. Occasionally conduct interviews in missionary apartments. As you do so, have your companion or the assistants to the president review missionaries’ area books and daily planners. Frequently review missionaries’ daily planners. Occasionally attend a ward council meeting.